The time: Christmas, 1970. The place: Provence. The host: Julia Child. Who wouldn't want a seat at that table? Only one woman: the sometimes reclusive writer M.F.K. Fisher. This year, Fisher's great-nephew, Luke Barr, finds out what she missed. Julia Child's Christmas goose was a deep, golden-mahogany brown, the skin roasted to a delicate crisp. Inside was pork, chestnut and prune stuffing. On the table in my living room was a glistening brick of jambon persillé—pale green aspic embedded with cubes of cured ham. My guests were drinking rum, Dubonnet and vermouth cocktails, a drink invented by Paul Child that he served before dinner on December 25, 1970. The house was filled with the narcotic smell of Christmas. I was re-creating this long-ago holiday dinner, bringing to life as faithfully as I could a key moment from my book, Provence, 1970: M.F.K. 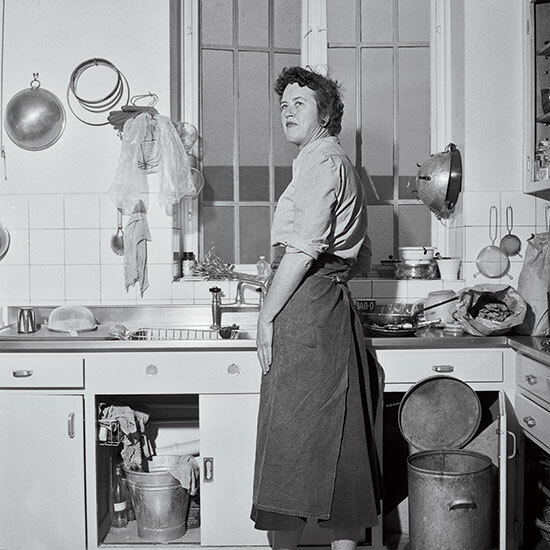 Fisher, Julia Child, James Beard, and the Reinvention of American Taste, which tells the story of a singular gathering of some of the key figures in the American food world. Julia Child's vacation house in the hills of the Côte d'Azur was the center of the action, and the weeks before Christmas saw the comings and goings of Fisher and Beard, as well as Simone Beck, Richard Olney and Judith Jones. Based largely on the correspondence of this group, and on the journal kept by my great-aunt, M.F.K. Fisher, which I discovered many years later, my book explores their meals, conversations and arguments at what was a combustible moment in culinary history. The 1960s had changed everything, including food and cooking. Americans were no longer taking the supremacy of French haute cuisine for granted. There was a new, bohemian energy in the air. American food was changing. So why had Child prepared the most traditional of Christmas dinners? And why had M.F. taken off so abruptly, traveling to Arles and then Avignon to spend the holiday alone? I'd considered these questions as I spooned the stuffing into the bird and trussed its legs (Child being a great believer in very elaborate trussing) and slid the goose into the oven, but I was soon distracted by more urgent matters: My oven had caught fire. It was only a small fire, but…But let me back up a little—all the way back to that night in Provence, in 1970. It was an unusually cold Christmas for the south of France, the mistral blowing in from the northwest, a snowstorm brewing. (The following week, a huge swath of the country would be snowed in.) Child was in her kitchen at La Pitchoune, as she and Paul had named the small house they'd built on the estate of her cookbook writing partner, Simone Beck, in Plascassier. It was set on a hill not far from town, and off in the distance were the lights of Grasse. The air was clear and carried a faint, wintery scent of smoke. The kitchen was warm; there were two geese roasting in her temperamental La Cornue oven. The Childs had invited a throng of guests—relatives, old friends visiting from London and Child's editor at Knopf, Judith Jones, who had discovered and championed the seminal Mastering the Art of French Cooking years earlier. Jones and her husband, Evan, were staying nearby, but they had come early to help with the cooking. The mood was celebratory—Child and Jones were on vacation, and the long and intense work on Mastering the Art of French Cooking, Volume Two, which had come out to rave reviews the previous month, was behind them. "I keep thinking, Thank gawd that dreadful book is done," Child had written in a letter to Beard, "and I don't have that driven feeling, that guilt of non-accomplishment always gnawing me." Beard had just left France a few days earlier. He had been holed up at a nearby diet clinic, and then he'd come to stay at La Pitchoune for a few days before heading back to New York. M.F., too, had departed the previous week, after renting the first floor of an old farmhouse nearby for the previous two months. Richard Olney, an American food writer who now lived in Solliès-Toucas, near Toulon, had come to visit Child as well. His presence had set off sparks. Olney's French Menu Cookbook, published that fall, pioneered an ingredient-driven, purist approach to French food. (It was the first cookbook to be organized by season.) He thought of himself as a far better cook than Child, and was disdainful of her amateur, TV-cooking-show audience. Olney did not have a television. My great-aunt was suspicious of Christmas, of all its commercial and religious trappings ("To hell with Noel" is a line I came across in her journals), and maybe that's why she'd wanted to be alone. She was wary of nostalgia. Christmas Day, 1970, found her at the luxurious Hotel d'Europe in Avignon, drinking a glass of Champagne in her room and looking at the fountain beneath her window. It had frozen over, and it stood silently, long white icicles reaching from the spouts down to the pool, a small Christmas miracle. As they stuffed the geese, Child and Jones discussed the goings on of the previous week. How was Beard's health? Had he lost any weight at the diet clinic? (He hadn't.) Was Olney really as brilliant a cook as his superior persona seemed to imply? (Maybe.) Why had M.F.K. Fisher gone off on her own? (The solitary life of the writer, apparently.) Jones would be meeting her in a few days in Marseilles. Child talked about her fraying partnership with Beck, who resented Child's growing TV celebrity and considered herself to be the authority on all things French. Child, meanwhile, was growing impatient with classic French cooking and looking forward to exploring new things: a New England clam chowder, an Indian curry. Jones, too, was thinking beyond France and would soon be publishing books by Marcella Hazan, Claudia Roden and Madhur Jaffrey. Still: France was where it had all started, for all of them. The epiphany of good French food—the first taste of crusty French bread and creamy French butter, the first bite of sole meunière—these were the things that inspired them to teach Americans how to cook, to redefine the art of eating. M.F., Child, Beard, Olney and Jones had all found their love of food in France in the 1930s, '40s and '50s. And it was easy to indulge in a bit of nostalgia, especially during the holidays. Jones and her husband spent their days exploring the local villages and food shops, reminiscing about their earlier travels in France together, back in the '50s, and their own moments of food discovery, never forgotten. Now, as they walked the streets of Plascassier, it was as if nothing had changed. There were, she wrote in her memoir, "the pâté de bécasse in oval crocks, with the woodcock's head and long beak emerging at one end and the two clawed feet at the other; whole alouettes, little larks embedded in jelly; terrines of hare, duck, pheasant; and whole stuffed piglets with 'joyeux Noël' written in strips of fat along their glistening sides." And perhaps this was the reason Child chose to roast a very traditional, very French Christmas goose. As much as she was ready to break with France, she loved it deeply. Like many a holiday meal, this one was a love letter to the past, a celebration of memory. And so she cooked, stuffing the birds with chestnuts and prunes while Paul presented the drink he'd invented for the occasion: French vermouth, Dubonnet, orange essence and dark rum. (This was the era of reverse martinis and other vermouth drinks.) They raised their glasses and toasted the season and change and the coming snow. At home in Brooklyn, I made the same drink for my guests, and it tasted perfectly modern, astringent and warming. As we drank, I told my guests about the fire: Despite my best efforts, a bit of goose fat had escaped the roasting pan and lit up at the bottom of my oven. It's the kind of thing that must've happened to Julia Child at some point, and it did cross my mind: What would she have done? Well, I turned off the oven. I took the goose out and closed the door. The fire refused to go out. Then, after a brief moment of panic, and a glance at my fire extinguisher, I smothered the flames with a damp towel. End of story. The goose went back in and roasted to perfection, and as I told my friends about the adventure (more amusing in retrospect than in the actual moment), I realized that this was just what Child would've done—told everyone about the mishap in the most entertaining way possible. Our goose was magnificent, and so was the stuffing and the brandy-based sauce. The flavors seemed inevitable—goose, prune, chestnut, brandy—and we carved up the bird and served it alongside rice, green beans and salad and poured glasses of Burgundy. We put two tables together and covered them in a dark red Jacquard Français tablecloth. We could feel the Provençal holiday spirit that had eluded my great-aunt, all the better for being slightly haphazard, and perfectly traditional. We had put out the fire and roasted the goose, and were surrounded by friends. Brooklyn-based writer and editor Luke Barr is the news director at Travel + Leisure. His first book, Provence, 1970, is in bookstores now.